PFC merger tool allows to combine multiple AOL email files from different system into one folder to access all emails at the same time. If you have multiple PFC files in archive then merge all AOL files. The PFC merge tool merge all your PFC files and it will also exclude the duplicate items from the folders. PFC merger remove the identical items after merging PFC files. Join is the option which helps you to combine multiple PFC files into a single PFC file with their own individual folder hierarchy. If two different PFC files have inbox1.pfc and inbox2.pfc then both files will save in a new PFC file separately. What is the difference between Join and Merge options? Merge option helps you to simply merge two or more PFC files into a common PFC file with common folders. Whether Join Option helps you to save all items into their individual folders and helps to save all the items separately. 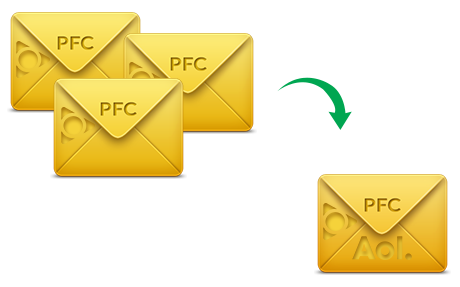 If two PFC files have inbox folders and after merging them it will create inbox1 and inbox 2 separately in Joined PFC file. Is software is compatible with AOL desktop software 9.8? Yes, PFC merger tool is fully compatible for AOL Desktop Software 9.8 (beta version). How many AOL mail files can I merge at a time? You can add any number of file either individual or in bulk. Can I save the merged PFC into a new folder? Yes, after merging AOL PFC files you can save that file anywhere on your computer or you can create a new folder directly by the software. I have faced many issues while managing multiple PFC files and it is too much difficult for me to handle both separately. I came to know about the PFC merger tool and I found that this application is exactly what I needed. PFC merge is a great tool. When I saw its features and freeware I tried it immediately and the satisfaction made me to invest without wasting my time. The software easily install and run in any Windows OS including 10.